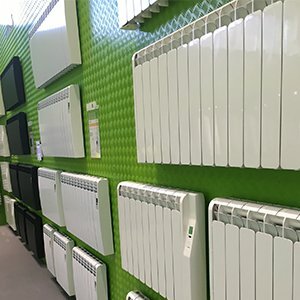 When Rointe invited Heater Shop to visit their factory in Spain we obviously said yes – A long weekend away to Spain exploring where our best selling products are actually developed and produced would be a fantastic opportunity not to be missed. The fact that it was in the beautiful Spanish sunshine, had absolutely nothing to do with it! A hybrid team of 7 made the 2-hour Sunday evening trip to Spain spending an intensely itinerary-specific planned trip with the objective of absorbing everything there is to know about Rointe products including the new Rointe Delta WiFi products. If this team thought they were there for a jolly, the 8am start certainly put a stop to that. A 4-hour tour around the factory and numerous testing areas, watching on as the Rointe products were put together was very interesting and insightful. But, for our motley crew the 12 0’ clock lunch break of Spanish pastries seems to be what they remember the most about their morning. In the afternoon, a fantastic training program of new products was on the agenda. Directing the focus on the new Rointe Delta range was first on the schedule, as it is really starting to take off with its association to the Rointe Connect App. The new Rointe Connect App was specifically elucidated with regards to how it works/connects with the associated heating units, and why the detailed features were developed and integrated. Particularly exciting, is the option to control your heaters, both singularly and in user-created groups, just from a touch of your phone – no matter where you are. The Delta Ultimate also offers the new RAL palette radiators (a minimum of 20 to be ordered for this), and a fantastic towel rail range to compliment the Delta brand. The Delta range furthers the success of the Rointe Kyros as a new low-power technology incorporating ‘fuzzy logic energy control’. The new Rointe Delta Ultimate heating system will revolutionise the way in which we understand and utilise electric heating, both in the home and work space. In the evening our team were treated by Rointe to traditional Spanish delights –devouring an abundance of tapas; black squid, artichoke … steak and many other delicious dishes. The team certainly filled their boots after a demanding, yet highly fascinating day in their new surroundings. After an eventful evening, our not-so-hybrid team made the trip back to the UK to reflect upon the fabulous trip and immediately reported back to the office 'all' the experiences that were lavished upon the team. Overall, the trip gave us a great insight to not only how the Rointe heaters are produced, but also the various stages of vigorous testing each line of heater went through before actually making it to the lorry ready for shipment to the UK. It's easy to see why the Rointe Delta has taken off and we are confident in our knowledge that as an approved Rointe distributor, we are selling a rigorously tested and remarkable product. P.S We hope this to be an annual trip, ideally in the height of summer!